The New iPad + Apple Pencil ad! Neat showing of the pencil. Still, Pencil is $89 for schools, $99 for the rest of us. Logitech crayon is only $50 though. Does anyone know how much RAM this new 6th-gen. iPad will have? I believe the previous generation had 2GB. It appears it still has 2 GB. I really think this is the same as the "old" iPad (2017), same case and internals except for the A10 processor and support for Apple pencil. I use the pencil with my large pro. My new 9.7 is not the pro version. Didn’t need it and didn’t want the price sticker. I broke down and decided to get the logitech case keyboard. Can use when typing more and I will still use the plain case if out and about and not typing a lot. Easy to switch it out. I like cases. I can’t return the case I bought so will use it. I wasn’t going to get a keyboard case for the smaller 9.7 and just use a stylus but I found a good deal on ebay for 26 bucks so what the heck. I bought my son an iPad 2018 for Christmas and I'm considering getting the Apple Pencil to go with it. He's 12yo almost 13 and very artistic. I slightly cringe at the price for the Apple Pencil and the reviews overall are a crap shoot on durability, longevity, and battery life. Can anyone give me advice or thoughts on the Apple Pencil for a soon to be teen?? While I don't actually have the pencil, from my playing with it and what others have said about theirs, the Apple Pencil isn't that easy to break. 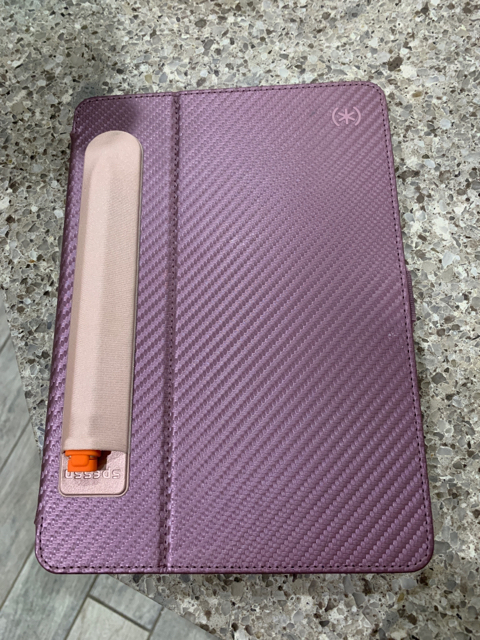 Likely the biggest concern would be while charging, when you attach it to the bottom of the iPad, merely because of how long the pencil and iPad are together, with the Lightning connector being a weak point while plugged in. I think my bigger worry, depending on how responsible the teen is, would be the pencil getting lost. I'm not sure if you've considered it, but it would likely be worth also looking at the Logitech Crayon -- it will do some of the same things as the pencil but is half the cost. If you are worried about the pencil, you might see if the Crayon will be enough for your son. Just went and got the new Apple Pencil. Hooked it up but it stays at 83%. It doesn’t seem to be charging. It says it’s paired. Looked at the % and it’s 82% now. Haven’t used it yet and it’s going down. Also. My iPad is about 56%. Maybe it has to be fully charged or something close to it. Update: Should of played around with it first. Took it off and re put it on and it said Apple Pencil and showed 82% and it was charging. Wow!!! Already in about a minute it went to 89%. This new pencil charges fast. I bought my kids the 2018 iPad and the Logitech Crayon for their 13th birthday this year. They LOVE them. The crayons seem very durable and are easy to pair and charge. I also bought pencil sleeves that stick on to the iPad case and so far they’ve done the trick keeping them together. How Facebook know what apps I have installed on my iPhone and iPad?